The new trade deal is signed, but will the U.S. Congress approve it? WASHINGTON — The NAFTA-bashing president of the United States used his state of the union speech Tuesday to urge a divided, combative Congress to come together to ratify a continental trade pact he's convinced will breathe new life into America's moribund manufacturing sector. In the same breath as he derided NAFTA as a "catastrophe" and a "historic trade blunder," Donald Trump sang the praises of the U.S.-Mexico-Canada Agreement as a recipe for resurrecting his country's farm sector, creating blue-collar jobs and restoring the lustre of the once-mighty American auto industry. Speaking to a joint session of Congress one week later than originally planned, Trump described meeting struggling workers in Rust Belt states who lost their jobs and livelihoods to 25 years of trilateral free trade that caused manufacturing work to migrate south, lured by low labour costs. "For years, politicians promised them they would renegotiate for a better deal. But no one ever tried until now," he said. "Our new U.S.-Mexico-Canada Agreement, or USMCA, will replace NAFTA and deliver for American workers, like they haven't had delivered to for a long time. I hope you can pass the USMCA into law so we can bring back our manufacturing jobs in even greater numbers, expand American agriculture, protect intellectual property, and ensure that more cars are proudly stamped with our four beautiful words: made in the U.S.A."
Trump's trade czar, Robert Lighthizer, issued a statement after the speech that described the USMCA as "a model for all future trade deals" — a harbinger of what might be U.S. thinking on its ongoing trade efforts with China, which the president promised would deliver "real, structural change to end unfair trade practices, reduce our chronic trade deficit and protect American jobs." 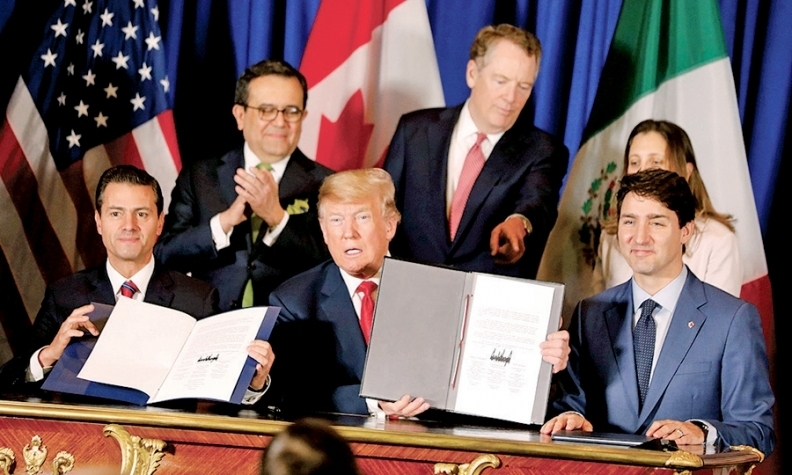 The new agreement largely preserves the structure and substance of NAFTA. In one new feature, the deal requires that 40 per cent of cars' contents eventually be made in countries that pay autoworkers at least US$16 an hour — that is, in the United States, or Canada, but not in Mexico. It also requires Mexico to pursue an overhaul of labour law to encourage independent unions that will bargain for higher wages and better working conditions for Mexicans. The new free-trade plan also raises the portion of vehicle content that must originate within the North American region to 75 per cent, us from 62.5 per cent, to sidestep tariffs. Whether Congress will indeed ratify the new trade agreement remains an open question. Democrats, who won control of the House of Representatives in last year's midterm elections, have expressed misgivings about the deal — in particular what they say is a lack of enforcement tools for the deal's labour and environmental protection provisions. And in the current political climate, with the 2020 election machine throttling up to full roar, few are feeling inclined to give the president even a single political victory. "If the president truly wants to support American farm families, he will begin to restore our reputation around the world as a reliable trading partner," National Farmers Union spokesman Rob Larew said in a statement. "He will reassert American leadership in the international trade arena, rather than straining relationships with our top trading partners. "To tout progress with China or USMCA is misleading — you can't dig a ten-foot hole, fill it up with a foot of dirt and call it a win." Stacey Abrams, the Democrat who rose to prominence last year with her unsuccessful bid to become governor of Georgia, delivered the Democratic response to Trump's speech, savaging the president's insistence on a U.S.-Mexico border wall and lack of action on gun control, among other things. And though she didn't mention USMCA by name, his approach to trade is proving counterproductive, she said. "We owe more to the millions of everyday folks who keep our economy running, like truck drivers forced to buy their own rigs, farmers caught in a trade war, small business owners in search of capital and domestic workers serving without labour protections," Abrams said. "Women and men who could thrive — if only they had the support and freedom to do so." Trump also used Tuesday's speech to urge an end to what he called the politics of "revenge, resistance and retribution," warning his critics away from zealous investigative pursuit of his presidency and his 2016 campaign for fear of hamstringing a humming U.S. economy. In taking credit for that economic strength, Trump inadvertently delivered one of the night's most memorable moments when he noted that 58 per cent of the new jobs created in the last year went to women. That prompted several of the 36 new female members of Congress, many clad in white in a show of solidarity with the suffrage movement, to pretend the president was talking about them as they got up and celebrated their electoral success. Trump did not appear overly amused, but he rolled with the punch — "Don't sit down yet; you're gonna love this," he urged them — as he continued with his prepared remarks, which acknowledged their achievement. "Exactly one century after the Congress passed the constitutional amendment giving women the right to vote, we also have more women serving in the Congress than ever before."